BSNL Mobile declares upcoming festivals Christmas 2015 and New Year Eve as Blackout days for all Prepaid plans mobile customers in Kerala Telecom Circle. 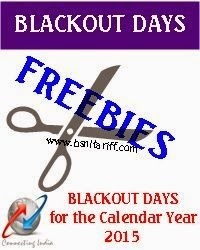 State run Telecom Company Bharat Sanchar Nigam Limited (BSNL) has announced Blackout days for upcoming festival Christmas 2015 (25th December, 2015) and New Year Eve (31st December, 2015). Where Prepaid customers will not allowed to make any confessional tariff Voice calls/SMS on their prepaid account across Kerala Telecom Circle. Under this Blackout days, all Voice/Roam/SMS/ISD STVs, Friends and Family Offer, Free Calls to Pyari Jodi Landline, Plan Voucher Freebies et., including STV 135 and STV 149. After announcement of blackout days for these two days by BSNL, Prepaid customer to maintain more balance to make voice calls/SMS to wish their relatives, near and dear on Christmas days 25th December, 2015 and New Year Eve 31st December, 2015 under Prepaid mobile services.